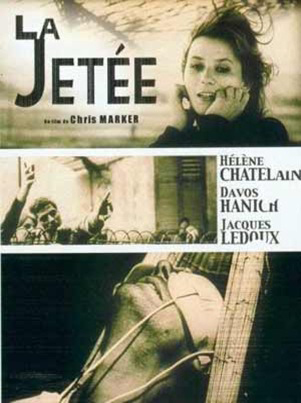 Chris Marker is a bit of a legend among art school film students for his stunning experimental La Jetee. A highly influential science fiction film made up entirely (except for one moving image) of black and white photographs and voice over. It’s a huge testament to how much can be achieved with so little. I find myself now especially inspired and excited about the simplicity. Making movies is a long, exhausting, expensive effort and hard to do on your own. Jim and I have so many stories we’d like to tell, and a piece like La Jetee proves that typical film making isn’t always the only or the best way to tell one. This fact is proven by Terry Gilliam’s 12 Monkeys, which was adapted from this short. For all the big name actors, cinematography, long running time, and imaginative director, it wasn’t nearly as memorable and effective as the original low budget project. The images, though fabricated by Marker, feel like photojournalism that has captured events as large as the end of the world and as small and personal as a smile. Le Jetee can be seen on netflix instant and was released by Criterion with, no doubt, lots of interesting history and commentary.